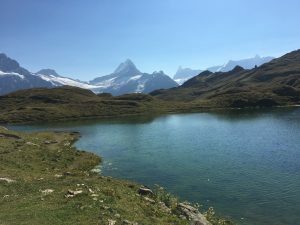 After London and Colmar (see previous post) Grindelwald in Switzerland was our base for another week. It’s a beautiful village clustered under the Eiger and other peaks in the Alps, served since 1890 by BOB, which we eventually discovered was nothing to do with an English builder, but the Bernese Oberland Bahn: the local railway. When we were travelling across Europe by train Mrs TD and I struck up a friendship with a charming couple, H and M, who’d run a school for years. M has a wicked sense of humour (offset by a baffling love of golf) and enjoyed setting challenges for us. His first: what’s the meaning of the name Grindelwald? (Nothing to do with JKR and the annoying Potter person). I knew that ‘wald’ was forest or wood, so ‘Grindel’ must be a version of Grendel, the monster dispatched by Beowulf in the Old English epic poem – so ‘monster-wood’. No, said M. Nothing to do with monsters. It’s from old German-Celtic for ‘a piece of wood serving as a barrier’ – so it’s the valley blocked off from the rest of the world. Suggests the source of Grindelwald’s other-worldly tranquillity (despite the tourists). We taught M and H to check the number of steps they’d taken each day on their phones – another challenge: who could do the most steps each day? It all became very competitive. On one occasion I noticed M doing a little circular jig on Grindelwald station platform as we waited for a train, just to increase his step count. Shameless. 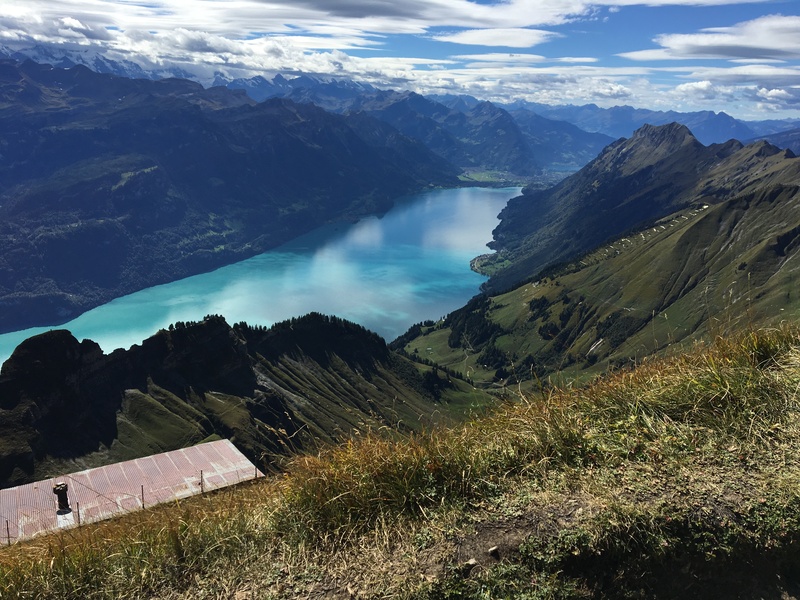 Our first trip took us up via a scarily vertiginous cable-car to First ridge, where we hiked up to the lake of Bachalpsee. Resting by the lake we were stirred by the haunting melody of an alpenhorn. 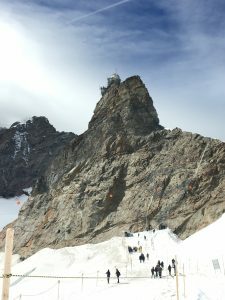 It took a few minutes to locate the source of the music; eventually we spotted a man with his alpenhorn, standing on a peak hundreds of metres above us, playing. The sound resonated round the natural mountain amphitheatre – magical. Below the N face of the Eiger. 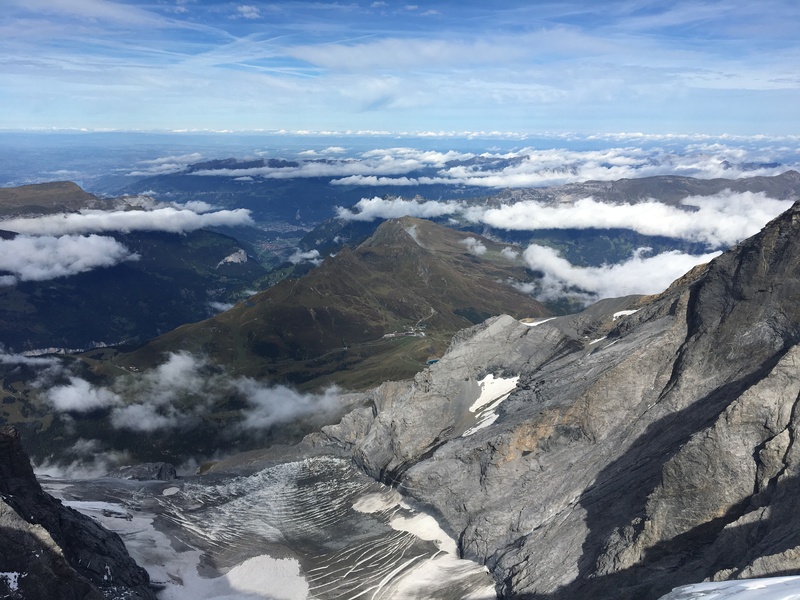 Most of the people on holiday around Grindelwald were from S. Korea, Japan or China. I know this because another of M’s challenges was to interview as many of these tourists as we could to determine where they were from. Backfired on one occasion; I asked a couple who looked Chinese (and were talking in what I took to be Mandarin) where they were from. ‘Actually, London,’ they said. 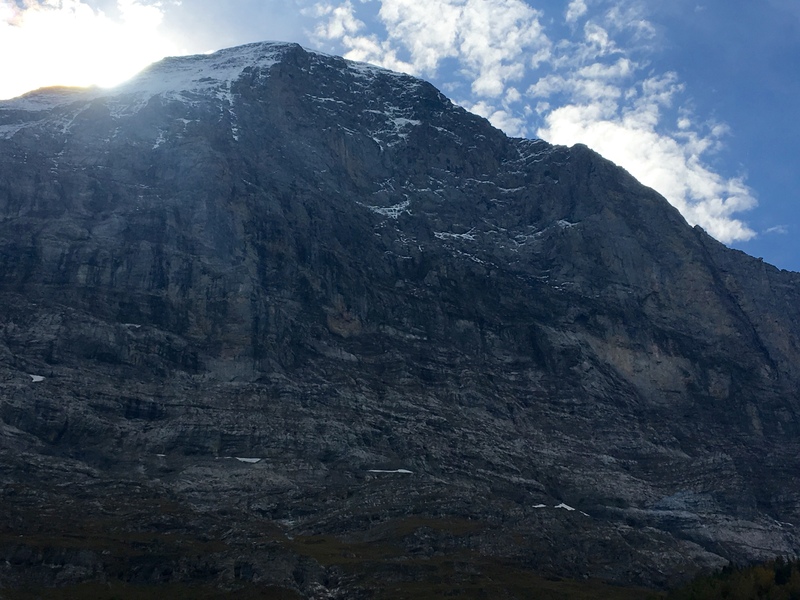 Another day we took the local train to Alpiglen and walked as far as we could up the trail that’s at the foot of the infamous north face of the Eiger. 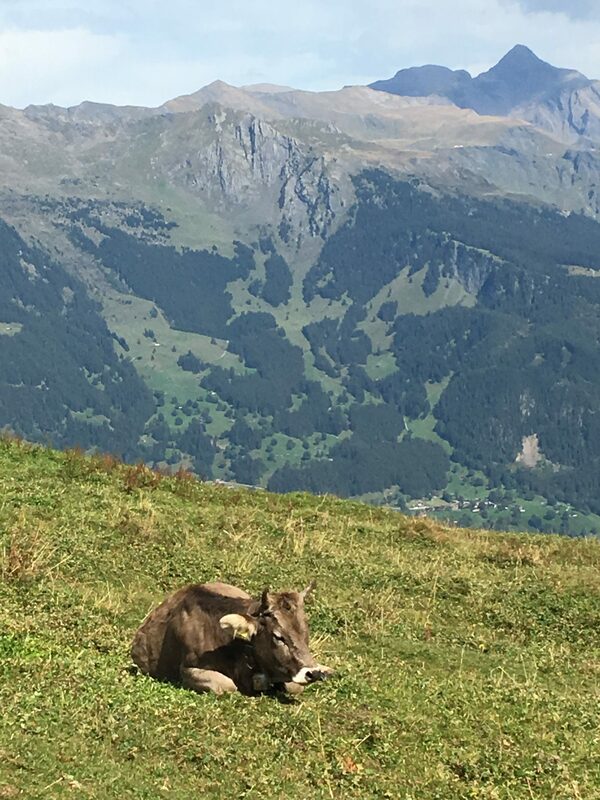 When the going became vertical we chickened out and retraced our steps, but not before Mrs TD had to resort to humming and singing as we walked through a meadow full of tranquil, handsome cows of a curious shade of grey-violet, with long white eyelashes; she’s very scared of cows. They all wore huge cowbells that could be heard for miles. I suppose that’s the point. We had coffee one morning on a terrace by Brienzersee, waiting for the little steam rack train to take us up to Rothorn mountain. By the entrance to the hotel was a statue of Goethe, and a plaque saying he’d stayed there. I was slightly disappointed to see little local wildlife on the trip. 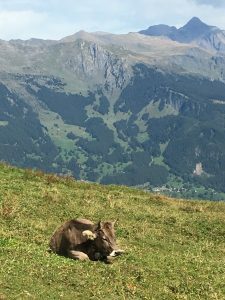 Marmots and ibex were seen by some in our group, but all I managed was the ridiculously tame alpine choughs, which scrounged food at Jungfrau and most other popular tourist spots, like importunate sable Cornish seagulls. I did see an albino deer with splendid antlers near Interlaken, but it was made of wood. 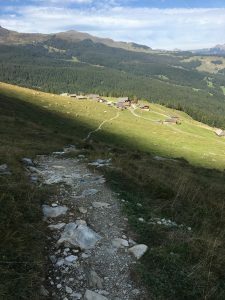 We often saw signs for a St Petronella route in the mountains. She was an early Roman virgin martyr, said to have been so beautiful her father (possibly St Peter) locked her in a tower to keep her safe from potential suitors. A pagan king wanted to marry her (how did they meet? Did he break in?) so she starved herself to death. It’s more likely she met a traditional martyr’s death. 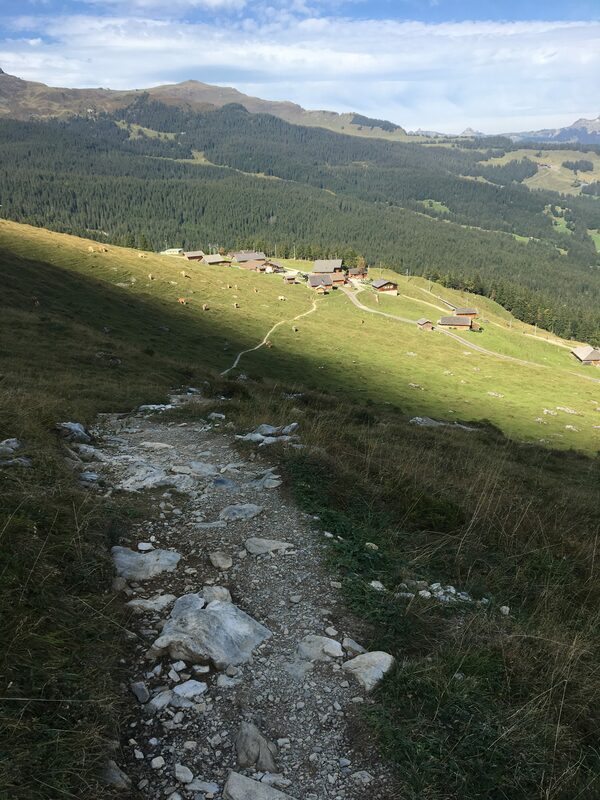 So why the trails and chapels in the Alps? Because she’s the patron of mountain travellers. I haven’t been able to establish why. Maybe the ‘rock’ element of her name. We’d never travelled as part of an organised group of 40, with a tour guide to shepherd us. We’d always gone independently. We were a little apprehensive when we first met our fellow travellers at St Pancras. But all went well, and we had a great time, meeting some lovely people. 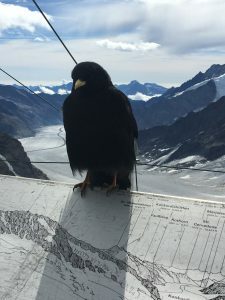 An alpine chough scrounging for titbits from the Jungfrau tourists. One chap of 86 was perhaps the most intrepid among us. 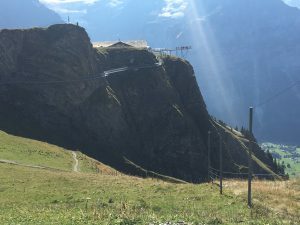 He took a sort of go-kart down from the First summit, and later a zipwire over a precipice. He’d regularly hike off on his own for hours, fitter and braver than us all. Hope I have even half of his energy if I reach his age. superficial gushing and aristocratic sentimentality – or even a sexual frisson as she and her cousin embraced on their exhilarating descent. Whatever Eliot meant, a rousing sense of awe and freedom is something we all experienced in the Swiss Alps.